When Yahoo offered paid maternity leave, 69% of female employees took it. Although I would like to say that the discrepancy between these two percentages is startling, it is in fact the exact opposite. 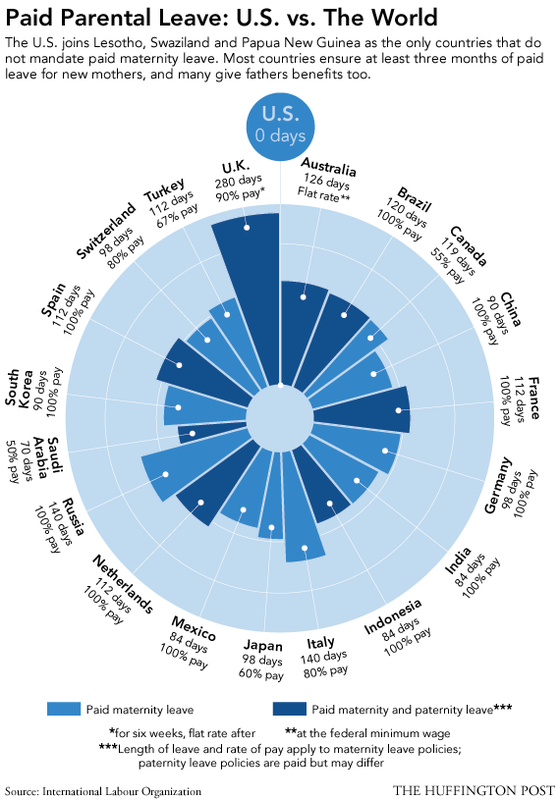 After all, paid paternity leave offered by major corporations is not a practice that we hear about frequently, at least not in the United States (see infographic below). Paid maternity leave, on the other hand, is a concept that our generation has been aware of for our entire lives. Paternity leave is novel, unconventional, and inspires a double take. In most of my experiences, traditional gender roles and stereotypes are most often discussed in relation to women. It wasn't until recently that I began to realize the harmful implications of the pressures placed on boys and men by our society. My first glimmer of awareness was sparked by the Project Unspoken video above, which presents an array of male experiences with patriarchy through interviewing various men in the Emory community. The prevailing standard is still for men to be the primary financial supporter of the family, to pursue "manly" careers and interests, to exhibit relentless ambition, to have a thick skin. The gender roles that we impose on men are just as detrimental to women as are the gender roles we impose directly on them. Corraling both sexes into these confining roles poses a significant barrier to changing attitudes that perpetuate isolation, not only here and now, but also in future generations. It only makes sense, then, that a large percentage of expecting fathers would not be comfortable with taking paternity leave. Societal standards dictate that no reasonable man should give up the glory of work and money in order to take on the stress and responsibilities traditionally associated with a stay-at-home mom. Because above all, paternity leave has the power to uplift women and start to unravel the web of gender roles that suppress their potential. Thanks to paternity leave, a man can spend time with his offspring in the most critical developmental period of his or her life, and make the most of an opportunity that may only arise once. Thanks to paternity leave, a man can stay by the side of his child's mother, ensuring that she is fully supported during this fragile period of time. Thanks to paternity leave, the household workload can be more evenly distributed between both parents, balancing the roles of both genders and promoting gender equity. In the 21st century, technological advances that allow employees to work from home have redefined the traditional nine-to-five work day, allowing for alternative working schedules such as flextime. For example, due to technologies such as videoconferencing or screen sharing, my father, who works for the United States Patent and Trademark Office, is able to work entirely out of his home office, providing him with the opportunity to spend more time with me when I'm at home. With more and more companies providing the option of flextime, they should capitalize on this new potential by implementing paid paternity leave. So, to all working men who are lucky enough to be offered paid paternity leave: understand the privilege you have been given, and pay it forward.